Interesting chat with a bunch of high performing students doing a high level course on artificial intelligence, at a top European University The course is around 50% pure maths, the rest data analysis, AI research, coding and neuroscience. Around 100 students started the course, unbelievably (and immorally in my view) there’s less than 30 survived through to the second year. These second year students are no slouches. Lectures are not recorded, much to the disgust of the students, who constantly complain about this. (even formally). The students complain that, for high-level maths, this makes absolutely no sense, in terms of teaching or learning. The lectures are experiences where the students desperately try to fathom out what is being covered in the course. They salvage what they can, then the real teaching and learning begins. Their lectures are all two hours long (wow! ), with as many as four, two-hour lectures in one day. There’s a huge amount of contact time, as well as projects. What is not clear is how productive that contact time is. Complaints fall on deaf ears. In a sense this has forced the students to create their own teaching methods. What online tools were they using? They do, of course, use a huge range of online resources both after and (interestingly) during lectures. Khan Academy, academic papers, online textbooks, but one tool surprised me. It’s called ‘Anki’, a spaced-practice, flashcard system. The tool encapsulates several simple principles in learning theory; self-generated content, chunking, active learning, recall as reinforcement and repeated practice. Theses are well-researched principles that are largely ignored in higher education. We have known about spaced practice for over a century, one of the most researched principles in learning, yet studiously, even wilfully, ignore the principle in practice. It is not difficult, in our connected networked age, to deliver this type of learning. Our learners have devices, laptops, tablets and especially mobiles that form an umbilical chord for learning. What impressed me wasn’t the tool, which I knew of, but the way in which they used the tool. You rate your own answers by choosing a rating; a spaced-practice interval. But here’s the clever bit, the algorithm, which is very sophisticated, also takes part in deciding what is delivered at what point in the future. (The algorithm is based on a well known algorithm for spaced-practice called SuperMemo.) On top of this, the ‘supervised learning’ is a combination of learner and system judgements. This no simple repeated practice system. The algorithm is very sophisticated, as is the input by the learner. These are AI students who fully realise the power of supervised learning, the combination of human and technology to optimise learning. They’re soaked in machine learning but also recognise its limitations, which they are constantly pushing out. These students were writing their own cards. They all use HTML or LaTeX, as it copes with the maths. They are way beyond Word. This act of self-creation is a great learning task in itself. Self-generated content is like souped-up note taking and results in significant increases in retention and recall. The students I spoke to recognised that they’re reinforcing content when they create the cards, as well as when they practice using the card decks. The addition of audio for language learning is also useful. They even share out the production task, so that each converts certain topics or lectures into cards for shared use. This pooling saves everyone some time, time that can be more usefully spent practising. One of the great things about this course is its project work. They’re set high-level tasks and randomly put into groups, then marked on the results. If you're going to do a computer acinece or Ai degree do one that has tons of project work. It works. They even run ANKI group sessions in twos or threes. Flashing a question up and going for the quickest to answer, a sort of live, gamification technique. This is a pedagogic technique invented by smart learners for other smart learners. An interesting angle here is that they especially like answering questions written by their colleagues, as this shows deeper understanding and prepares them for more possibilities in their understanding and exams. There’s a server AnkiWeb that synchronises delivery across a range of devices. Not that they'd use a tablet, as that would be a waste fo time and money in IT. There’s also a huge number of decks, especially for language learning, that are available for free. It also has its own analytics to show you what you've been doing across your decks, in terms of usage and success. That's useful feedback when you're trying to optimise your learning time. There's a huge range of plug-ins, such as text to speech with playback/recording, editing features and even Memrise, courses in languages and other subjects, with adaptive learning. The card system is heavily used by students learning a second language as it has this text to speech capability in many languages. It even copes with Japanese and Chinese (well used). Cards are produced on a laptop and they use it on laptops but the mobile version is used for revision, especially in cafes, on trains and so on. Fascinatingly there’s lots of use in lectures (when the lecturer is poor). This really is that rare beast – optimised, mobile learning. What is odd is the gap that has emerged between learners and those who teach. The gap has widened as ‘lecturers’ hold doggedly on to the twin pedagogic pillars of lectures and essays, while students find their own ways to learn. It is this lack of interest in learning and the tools that help students learn, that is puzzling. But what realy puzzles these smart students is why no one told them about these tools. They had to discover them by themselves. Isn't that odd? Maybe not. There’s an odd form of pedagogy that has been around a long time in our Universities, of not making life too easy for students, the idea that struggle is part of the process. This tool should be recommended for all students. You need not make any of this compulsory but surely giving students tools that take them beyond the lectures that fail them is worth trying. It is, of course, more suited to learning underlying knowledge but they have also moved into creating cards that pose questions that need the application of that knowledge or principle. This is not just a fact checker, it is high-level knowledge and skills. The one line I heard time and time again was “I wished I knew about this at school or at the start of the course”. These students know good pedagogy when they see it because they create and use good pedagogy for themselves, things they know work. Their views of lectures are, by and large, one of complete contempt. Thiel – Higher Education a bubble? I like Thiel, as much for the fact that he speaks from a position of success when he taks about business but also that challenges assumptions, especially on Higher Education. As the co-founder of PayPal and first outside investor in Facebook, he has since invested in many companies including LinkedIn and Yammer. He describes himself as a conservative-libertarian and espouses original views on business, social structures and education, that many find, if unpalatable, certainly interesting. In his book on entrepreneurship, Thiel is critical of those who imagine that entrepreneurship can be taught. This, he thinks, is flawed, as “The paradox of entrepreneurship is that such a formula necessarily cannot exist: because every innovation is new and unique.” He doesn’t think that successful, network businesses can be built by MBA types, who are drilled in seeing what is the case, rather than the all-important absences or gaps. He is also critical of educational systems that drive competition, an obsession with grades, which in turn lead to conformity. The best minds in the world now focus on driving people towards online ads or the unproductive and risk averse world of law and finance. This he thinks limits, rather than encourages personal ambition and progress. The insidious side of the Catholic Church was the threat, that if you didn’t pay up, you were damned. Similarly, if you don’t get a Degree, you’re damned as a failure, sent to some sort of economic hell, never being admitted to the heaven that is gainful employment and wealth. 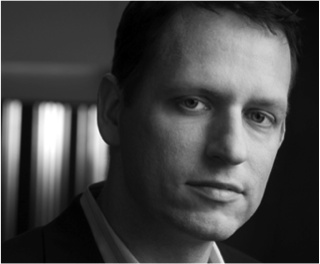 Criticising Higher Education is like “saying there’s no Santa Claus” claims Thiel. This is a feature of all bubbles, believes Thiel, where ‘groupthink’ takes over and false assumptions become absolute beliefs, and even debate of the negative consequences is seen as ‘party-pooping’. Higher education, he thinks, is a bubble fed by a vague abstraction - the word ‘education’. Is it an investment decision for a good job? Is it mere consumption, a four-year party? Or, as he thinks, an insurance policy that is not worth as much as you think it is. He charges the system with conformity, a position also taken by Noam Chomsky. Diagnostically, Higher Education suffers, he thinks, from a massive failure of the imagination, a failure to consider alternative futures. The net result is that everyone conforms and marches in lock-step to college to do similar degrees which results in homogenisation and lot less freedom of action, as people believe that everything has been exhausted, and the likes of law and finance are the only possible ways forward. He adds that the lack of focus on teaching has turned the system into an ‘incredible racket’. Technology does more with less, education does the opposite, it offers the same thing year after year, at a higher and higher price. No one could really claim that the huge hikes in pricing reflect corresponding hikes in the value of University tuition. So what’s happening? Universities are complicit in this. They raise prices because they can, without attention to lowering costs through online learning, fourth semesters etc. In fact the quality of tuition may have fallen, with more students and less qualified lecturers, matched by salary inflation at the top, higher numbers of administrators and wasteful capital expenditure in largely empty buildings. Like the housing market, where people rushed to take out loans (mortgages) based on the belief that the value of their asset will always rise (or at least stay the same), many suffered a shock when the value dropped. Huge hikes in prices for the buyer, now seem unrelated to the real price of the degree. This is exactly what happened in everything from tulips to internet stocks and housing. There is no compelling evidence that the future worth of degrees will be guaranteed. That’s the mistake made in all bubbles. In a bubble, real demand is brutal, and in a buyers’ market may lead to degrees being simple indicators of ‘class’ rather than intrinsic value. Universities may be creating their own bubble, dislocating cost from real value. Institutional brand ranking may lead employers to dismiss degrees from institutions perceived as second-rate. In short, your degree may become a liability while your debt remains all too real. In short, HE has all the hallmarks of a bubble. Resistant to influence from the outside it is heading towards a crisis, especially for middle-class students who are amassing enormous amounts of debt. As financial pressure mounts, the Reformation needs to come from the outside. To action his beliefs, about the inefficiency and often irrelevance of college, Thiel’s Fellowship programme funded $100k to each of 20 people under 20, to create their own companies. The programme challenges the idea that college is the only path for young people. Thiel has backtracked on some of his more extreme positions, such as his attacks on multiculturism and diversity, expressed in the book The Diversity Myth and his Fellowship programme has not been the success he predicted. It has been criticised for replacing education with ‘get rich quick’ programmes. His extreme views on the role of women and their political liberation have been roundly attacked as antediluvian. Thiel is a contrarian, and although many of his ideas seem outlandish, his critique of Higher Education articulates a growing dissatisfaction with the status quo. Many see his position as exaggerated but it is cogent and based on his not inconsiderable experience in investments and predicting the future. Whether he’s right will be proven by future events. Stephen Downes and George Siemens, although very different, have two major things in common, connectivism and MOOCs. 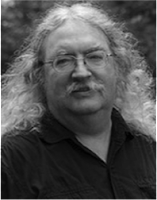 Stephen Downes sees himself as a philosopher with a professional interest in online learning, specifically the use of network processes for learning. This includes MOOCs and many other species of open, collaborative and online learning. 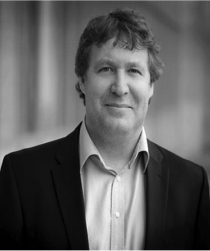 George Siemens is a complementary educator with similar views on connectivism and both a theoretical and practical interest in online learning and MOOCs. 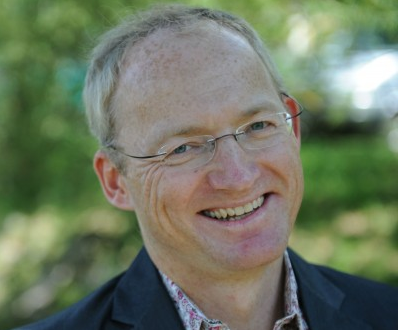 Siemens and Downes developed the concept of ‘Connectivism’, the idea that “knowledge is distributed across a network of connections, and therefore that learning consists of the ability to construct and traverse those networks”. They see it as an alternative to behaviourism, cognitivism and constructionism. Downes makes it clear that he is not a social constructivist. ‘Connectivism’ is very different from ‘constructionism’, as the focus is on the connections, not the structures or meanings that are being connected across networks. Learning consists of the practices, by both teachers and learners that result in the creation and use of successful networks with properties such as diversity, autonomy, openness, and connectivity. This was a real challenge to the existing paradigms, atht does take into account the explosion of network technology, as well as presenting a new perspective on the learning process. In 2008, Siemens and Downes designed and taught the first cMOOC. This has led to a commonly quoted distinction between cMOOCs (connectivist) and xMOOCs. cMOOCs are open, learner-generated, with a greater use of social and other networked tools. xMOOCS, which in reality is most MOOCs, are more formally presented in a more traditional course structure, with video, texts, computer marked assessment, peer assessment and social interaction. 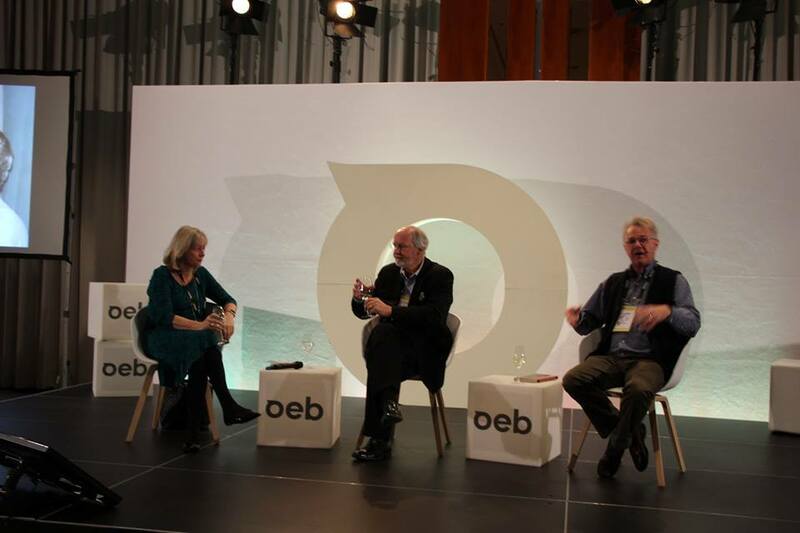 Siemens and Downes can certainly be said to have kick-started MOOCs but only in the sense of being the progenitors of one species of MOOC (connectivist), which have not yet reached any significant critical mass. While it is true that Siemens and Downes delivered the first MOOC, it was not the first massive, free or even open course (a fact acknowledged by Downes). Others in the corporate sector and online had delivered such courses. Nevertheless, they remain, on this front, pioneers in MOOCs and online learning. Connectivism has been challenged as simply a descriptive, umbrella term for what is known as social learning, a diffuse description of the simple fact that people are connected and learn by that means. It can also be seen as placing too much focus on the delivery mechanism, as opposed to the individuals’ cognitive processes, demoting learning to a mere epiphenomenon. Indeed, it does seem to demote what many see as real (personal and mental) cognitive learning processes and practice. As a ‘learning theory’ it can also be seen as descriptive of only a subset of learning. It is ‘a’ learning theory, applied by some, but can in no way be described as ‘the’ learning theory. On MOOCs, the distinction between cMOOCS and xMOOCs is often misunderstood. The ‘c’ does not stand for constructivist (Downes is not a social constructivist), it means ‘connectivist’. In any case the distinction is too binary, as there’s a variety of MOOC types that defy this simplistic, binary distinctions. New taxonomies are emerging that more accurately reflect the variety of real MOOCs. This exaggerated binary distinction has led to simplistic criticism of many MOOCs as being poor in terms of their social dimension. This falsely skews the debate away from the variety of pedagogic approaches in MOOCs keeping the debate at an oppositional, binary level. 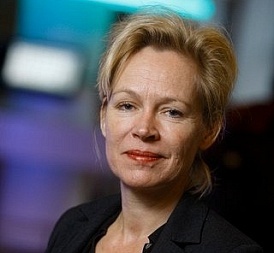 Downes and Siemens have defined a learning theory, connectivism, that has stimulated debate around the nature of learning, especially in a highly networked and increasingly technological world. Connectivism is a fascinating flip away from the preceding learning theories, in that it takes technology and networked processes as it’s bedrock, not behavior, internal mental processes or socially constructed meaning. It has stimulated debate but has yet to really challenge other more dominant belief sets in the world of learning. Beyond this, they remain significant figures with high quality output, not only in terms of MOOCs, but across the whole learning sphere. 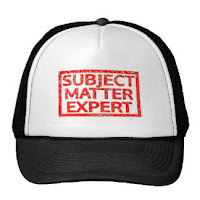 An SME is a Subject Matter Expert. Remember this, as they may lack expertise in other areas, such as learning, time management, design, graphics and editorial skills. Nevertheless, they play an important role in the team. So what do you say, practically, to an SME, at the start of a project? The SME is an expert in the subject, not the project manager, designer, editor, graphic artists or tester. It must be crystal clear what the ‘role’ entails. There’s no problem in allowing SMEs to play other roles but be clear what those other roles are and the parameters within which the SME will work in each of those roles. There tends to be a sort of skills creep here, where the SME assumes they have overall design control and skills beyond their ability and remit. Note that some SMEs have other skills but how likely is it that they have project management, interface design, writing for screen, graphic, audio, animation, video, technical, tool, copyright and interactive design skills? It pays, on both sides, to be honest and realistic on who does what and why. Identify exactly what you require in terms of tools. Is it Word, Google docs, templates, authoring tool? The there’s the format or template on the page/screen? Then there's the file format, file names and versioning. Where is the content to be stored? Dropbox, sent in by email? Finally, there’s the issue of communication. Establish rules for email communications, so that it is clear how often you communicate and by what means. Why? Because things will slip. A full exchange of email addresses, Skype names, Facebook, whatever, is always in order. Don’t assume that your SME will deliver on time. Identify their holidays and other time commitments. SMEs, especially those new to the task, often underestimate the time that is needed, as content for online delivery needs to be substantial and of high quality, not a set of rough course notes. If it can slip, it will. Their expertise is rarely in the domain of project or time management. In fact, this may be their greatest weakness. First, build in some contingency, then allow for several iterations. Have a B-plan. With freedom comes responsibility. While a SME should be encouraged to be creative and to think about engagement, good learning theory and strong pedagogy, there are real design constraints that need to be explained. There’s the practical design constraints in terms of what can be presented on the screen, technical constraints on types of media. It is vital that the SME grasps the concept of 'chunking' and the good use of media and media mix. It may be wise to provide detailed guidelines in terms of a structured outline, word counts, even templates. SME output will invariably have to be edited and cut down to size. Writing is really all about rewriting, especially; a) when the SME is used to writing papers, manuals and books; b) when the SME has never been involved in teaching and learning. Most SME content needs an external eye, if not a good editor. Explain the difference between the written word and text on screen. Explain the need for cut-down, chunked content that does not overload the learner and always leave room for an external eye and editor. It is important to foster a good team atmosphere, and the right attitudes, from the start. Explain up front that things WILL go wrong and not to get too hung up on the occasional spelling mistake. I mention 'spelling' as I’ve seen grown ups become demonic on the issue. I've lost count of the times that the production process has unvovered errors in the SME provided material, even from HE, even from supposedly quality assured content. In fact it is probable. To err is human and a good collective spirit goes a long way. As the project progresses, it is important to challenge. On the whole, after 30 plus years of doing this professionally, there is overwhelming evidence to show that SMEs tend to shove too much stuff into online learning experiences. It is the job of the project manager, designer, and others in the team, to challenge that tendency, not only in terms of quantity but also on the grounds of relevant skills and learning theory. They know what they know, you know what you know – the two should not be confused. Another form of challenge is on delivery. It’s all very well being agile with SMEs but they have to deliver at the front-end of projects and need to know that others depend on their prompt and promised delivery. Explain these dependencies in detail, and this is important – also explain the fiscal and time consequences of non-delivery. In complex tech projects, there's often a scheduled graphic artist, audio recoding booked, whole video production team readt to roll and coders at the ready. The consequences of late delivery can be expensive, even catastrophic. It is vital that materials supplied are copyright cleared and that the team and SME understand the role of copyright with text, images, video and so on. SME content often contains material, especially images, that is not safe to publish online. On the other hand there is plenty of good copyright free stuff that is publishable. The whole SME thing is fraught with potential problems. As for the debate around SMEs creating content on their own, I’ve been in this business for a long time and I’ve seen no end of online learning experiences result in a huge, soggy or fragmented mess through lack of understanding on how people learn, poor interface design, poor media mix, huge dollops of unedited text and a lack of design and editorial skills. You need a team. Perfect time of year to visit Berlin and my favourite conference of the year Online Educa – like the gluwein in the nearby Christmas market, a pretty tasty brew – spicy and strong enough to keep the conversation flowing. I like the mix of the academic, government and business. In 2012 they were saying MOOCs are awful, 2013 MOOCs are dead, 2014 MOOCs are pedagogically weak. 2015 some still don’t like them but we can finally say they’re here to stay. 2016 will be “they’ve turned out to be alright after all”. What gave me heart about Higher Education was the fantastic talk by Anka Mulder, from the University of Delft. She posed a question. If Uber can destroy the business of driving and not own a single cab or employ a single taxi driver, and AirBnB can soak up the accommodation market without owning a single hotel, can this happen in education? She put up an innovative argument, that her institution could be such a global player. Brave, and I wish her well, as they’re adopting many of the necessary traits - but it’s unlikely. She did, however, argue that MOOCs are having a profound influence, not only as outreach by institutions to new audiences but also on the potential use of MOOCs internally for campus students. Her advice, which is innovative and sound, was to form alliances, as the airlines do around the world, to deliver world-class, transferable qualifications, with other Universities around the world. Unfortunately, Universities are slow, bureaucratic, non-collaborative, often with national perspectives, high fixed costs and a reluctance to accept transferability, so it is likely that another player pulls off this trick. Her vision, like that of Jeff Haywood at the University of Edinburgh (see his brilliant talk here), is exactly what HE needs. The plenary session on AI in education was sharp, although mostly about AI and light on education. Toby Walsh rightly quashed the dystopian opinions of Hawking, Gates and Musk, along with Hollywood visions of Terminator robots murdering us in our beds, then reminded us that we actually live in the age of algorithms. AI is already here in Google search, Amazon, social media and almost every other species of online service. An interesting aside was that AI software had just (48 hours earlier) passed the Japanese University entrance examination, scoring well above the average score. He then gave us an informed view of how AI may affect the job market. I have written about this myself and highly recommend The Future of the Professions by the Susskinds, which looks at the professions one-by-one, as well as the complex economic arguments around job destruction (and creation). Jobs will be destroyed but new jobs created. However these jobs will be different and it is by no means certain that there will be a higher net number of jobs at the end. We’ve seen this before as mass employment moved from fields to factories, then came the shift from blue-collar factories to manufacturing robots. It looks likely that this will now happen to the white-collar professions. Education is not immune. We’ve already seen a vast reduction in the number of trainers, librarians and even teachers in my opinion, as tech has taken root for search, knowledge and learning. Fascinating. A key moment came on the second day when a neuroscientist asked the audience whether they believed in learning styles, that only 10% of the brain is used at any one time or L/R brain theory. There was a forest of arms for all three. She was polite but the response was shocking. Bewildering though this is, at least it showed the scale of the problem. It’s like going to a medical conference and finding out that the audience are really selling powdered rhino horn, herbs and homeopathic solutions. There was then an almost tragicomic moment when an audience member tried to defend learning styles – it was, of course, an anecdote, and the plural of anecdote is not data. As a counter to this stuff, I gave a whistlestop tour of 2500 years of learning theory (the good, bad and the downright ugly). 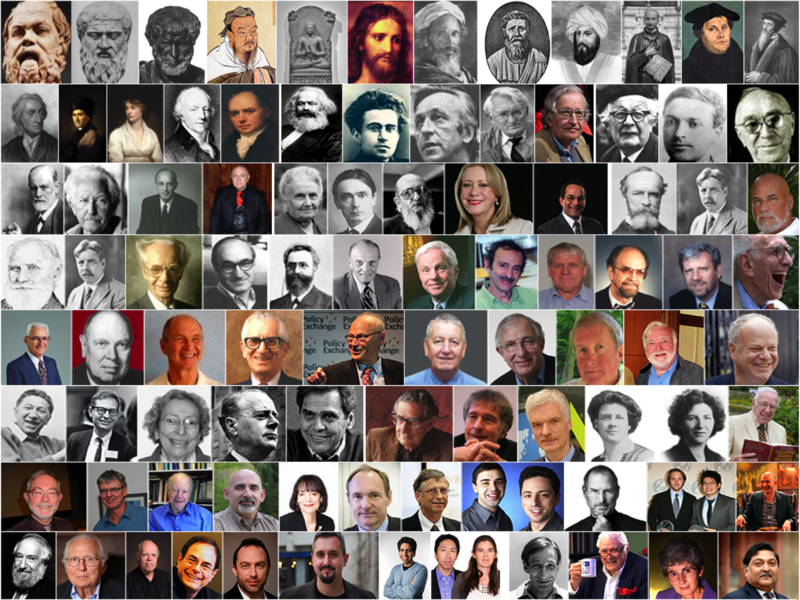 I went from from Socrates to Seligman in just 25 minutes, clustering learning theorists into: Greeks, religious leaders, religious educators, Marxists, constructivists, psychoanalysts, schoolers, pragmatists, behaviourists, cognivists, instructionalists, holists, assessors, educationalists, online technologists, online educationalists, cultural critics and outsiders. The good news is that people are starting to take the real (not faddish) psychology of learning seriously. We’re listening to Hattie, Black & Wiliam and Dweck in schools. 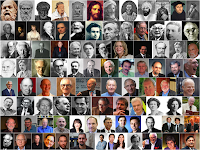 Taking Ebbinghaus, Tulving and Erikson seriously in terms of memory theory and practice. It takes time, but the dusty old boxes of dated, faddish and non-evidenced, learning theory and practice is being swept away by good research. General learning conferences often have a disproportionate number of people from Universities as they have the time and budgets. Vocational learning and schools are under-represented. This year I gave a talk about tech in vocational learning and was on a later panel discussing the issues. The session, with my friends from Africa, Jamaica and Malaysia, was exhilarating. We talked way beyond the end of the allotted time. The panel was fine but the chair insisted in posing the old trope questions about MOOCs and F2F mentioned above. I think it just wastes time. As Pasi Sahlberg says, vocational learning is back on the agenda, as many countries feel the fiscal burden of University education and start to experience graduate unemployment. In the UK, the main plank of the education debate was 3 million apprenticeships, something that the left wing parties should have pushed. Surprisingly, it was the policy of the right wing government and they won. Some great case studies popped out from Mexico, Malaysia, with Moodle, YouTube (as a learning platform), OER, even AR & VR. Big thanks to UNESCO for pulling this together. 6. Why is OER unused & unloved? It’s not that we don’t have enough OER resources or funding. Millions have been poured into this, by the EU and many others, but much of it remains unused and unloved in repositories that more resemble unvisited graveyards than busy learning spaces. What went wrong? Well, first, there has been far too much emphasis on reusability by teachers, who have an in-built aversion to using anything but their own stuff - far better to target learners. Second, crap marketing. The most used open learning resources, and I mean hundreds of millions of users, are Wikipedia, YouTube, Khan Academy, MOOCs and so on. That’s because they’re easy to use, free at point of delivery, useful and living, breathing systems that have exemplary marketing – and let me repeat, aimed at learners. It comes as no surprise, that these are precisely the things educators seem to delight in rubbishing. It's the mindset that's the problem. That’s a shame. Not a single session this year had the word ‘tablet’ in the title. This is heartening. The ‘keep on taking the tablets’ folk have disappeared as we get back to real learning and not an unhealthy obsession with often inappropriate, shiny objects. Enough said. For more on 'device fetishism' see here. Heard this phrase a lot, although it is so often used in the sense of Blended TEACHING, not ‘learning’ i.e. let’s keep on doing what we’ve always done, with some adjunct online activity. Nevertheless ‘Blended’ has taken root, which I welcome. It’s a good heuristic starting point, as long as people do a proper analysis and start with solid data on the types of learning, learners and available resources. Text, audio, graphics, animation, video, even VR are media types that have different advantages and disadvantages in online learning. When making learning materials and tools, so many ignore the research and lessons we’ve learned from past experience. We’ve had over 30 years of raw experience and need to listen to those who have trodden these paths before. Some good sessions on this, especially video, but I’d like to see a general session on all of them. For my own 100 tips on designing online learning see here. Friends of Jay Cross (I was lucky enough to know him well), who passed away this year, got together for a celebration to his life. His legacy, that we put too much focus on formal teaching, courses, structures and institutions and not enough on informal learning, lives on. I wrote this piece on Jay two years ago and included him in my list of greats, when I did my 2500 years of learning session. 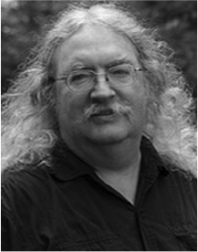 I missed Jay at Educa but he was there in spirit, especially at the dinner Rebecca held for us at Lutter, a beautiful old Berliner restaurant, where his friends did what friends do, reminisced, toasted and laughed into the wee hours – if you knew Jay, you’d know that was his style. Lastly, thanks to Berlin for hosting my birthday. I was toasted with Schnapps at midnight by my Educa friends in one of Berlin’s oldest restaurants, had a Champagne breakfast, drank Champagne before heading out with my family for a birthday meal and ate chocolate cake delivered unexpectantly to my room by the hotel. Thanks also to our hilariously irreverent tour guide on the Berlin boat. He blew away my hangover when he invited us to knock on Merkel's door (as she does a great Kartoffelsuppe), ridiculed the guy who failed to finish the airport (if he visits your town, make sure he leaves), then had a go at lobbyists as we passed Parliament, the pampered kids of politicians as we passed their creche, German pop music (with outstretched arms he mimicked ‘our Celine Dion’ doing her wunderbar Christmas Album), local planners (we Germans love a good plan), rising Berlin rents due to rich property speculators.... he should be in stand-up. A well deserved tip was in order. Have a Merry Xmas and happy New Year - see you all next year….. or for E-learning Africa in Cairo. The recent European refugee crisis saw catastrophic political failure in the EU. We neither prepared nor executed a rational and sensible response. It showed fundamental problems with the whole EU vision. At National level it was just as bad. The response was walls, fences, barbed wire and police. Government departments, even in places used to large numbers of refugees were overwhelmed. Beyond this has been the failure to adequately integrate past refugees leaving them marginalised and capable of horrific acts of terror born of resentment and revenge. We have not provided vocational education and jobs in enough numbers to integrate refugees, whether in the past or present. Our institutions are too large and inflexible, especially in education, to provide for the employment needs of so many people. We need to be far more agile. Technology has the ability to decentralise, disintermediate and democratise knowledge and services. It has speed, scalability and saving money on its side. You can get directly to refugees, as well as allowing them to get to you. This is not to say that it is the only solution. That would be blinkered. But it is a useful tactic within an overall strategy. So let’s see how technology can be used to alleviate what is one of the great political problems of our age. 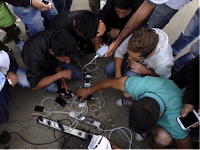 There was a furore when refugees were pictured with smartphones. How dare they ask for our help when they can afford such things? Yet this simply showed the gulf between perception and reality. The mobile phone is a lifeline in countries from which the refugees came. In the Middle East, a way of existing within a society that has rules about physical social contact; in Africa, the means by which one can get work, transfer money and keep in touch. A mobile phone is a lifeline for refugees. 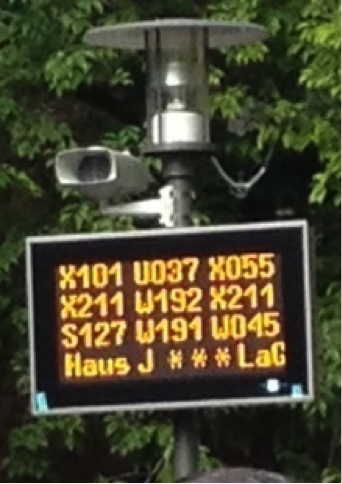 They are, after all, on the move – mobile. That’s why we must focus on this device when we think of technology as a solution to many (not all) refugee problems. Whether it be biometrics, data collection, money, language and finding information. Mobile should be the device of choice when it comes to integration and fostering autonomy in refugees. To this end we have useful initiatives, such as zero tariffs for key information and services, as well as connectivity movements such as the Humanitarian Connectivity Charter (HMCC), that tries to open channels to prepare and respond to humanitarian crises. To deliver effective solutions to problems, you need to know the scale of the problem and authentic identification is essential. We have seen refugees remove skin from their fingers to evade fingerprinting but the bottom line here, is that identification is necessary, even more so since the Paris bombings. 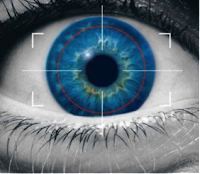 This is an area in which technology excels; fingerprints, retinal, iris, face recognition, voice recognition even vein recognition. A combination of these techniques is even better. So far, so good. But the real problems have only just started. The first big need when refugees find their destination, is orientation. Where do they find services, legal, health, education, language classes and so on. It can be bewildering, even frightening, arriving in a strange city in a strange country, where you do not speak the language. 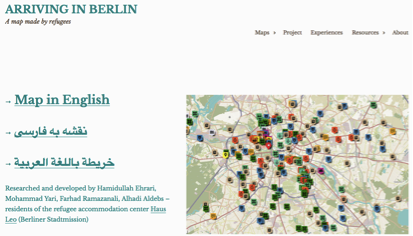 One of the best examples of an agile solution to this problem is in Berlin, where the refugees themselves have created a simple map, in English, Arabic and Farsi, with the location of key services. This is crowd-sourced and a great example of an agile project that empowers the refugees themselves, to help themselves, rather than the top-down approach. Hackathons aim to get real results in a short time, focused on real and immediate needs. To get useable results there needs to be the quick and exact definition of ideas. These are then executed by mixed teams, with a variety of necessary skills, to lead to success. When refugees arrive in great numbers, it creates the possibility of chaos and confusion. 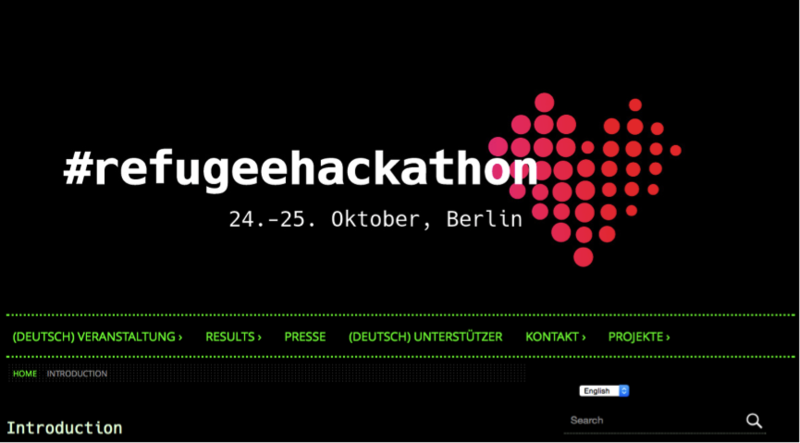 One hacked project that results in a solution to an immediate need was a number queuing system for LAGeSo (Landesamt für Gesundheit und Soziales) the first contact centre for refugees in Berlin. Refugees, who themselves speak a variety of languages, are likely to find themselves in countries where they do not speak the language. Even the second language they do speak may not be the language they need in their new host country. Intensive tutor-led classes are expensive, difficult to organise and competent teachers may be hard to find. One solution is to produce or reuse existing free online learning such as Duolingo and MOOCs. 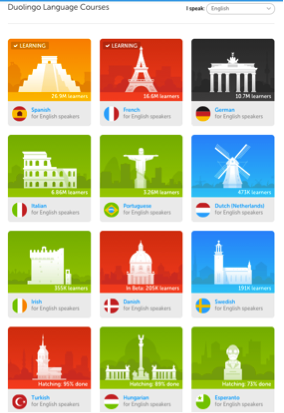 Duolingo is free, with over 100 million users and teaches Norwegian, Swedish, Danish, German, Dutch, French, Polish, Portuguese, Spanish and others…. 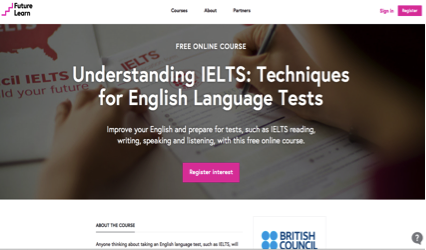 The IELTS test (International English Language Testing System) is the world’s most popular English language test for global migration. Over 9,000 organisations worldwide accept it; universities, employers, immigration authorities and professional bodies. Last year over 2.2 million tests were completed. This MOOC, the largest ever, had more than 440,000 learners from over 150 counties enrolled. 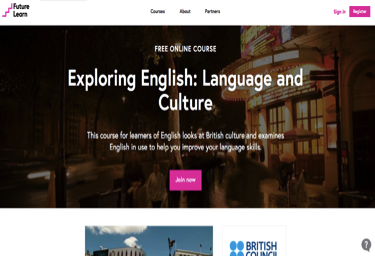 Another good example is the British Council ‘s free “Exploring English: Language and Culture’ MOOC. It has had 326,000 enrolments to date. Youth unemployment is the one thing we want to avoid with refugees. The way to avoid future disenchantment is fruitful employment. Academic structures, timescales and current vocational options are not good enough. Single course entry points are not enough. If you arrive in October, it is bizarre to have to wait almost a year to enter a formal course. Their needs are much more immediate and dynamic. The academic, agricultural calendar is ridiculous and the rigid layers in the system, make it far too difficult to cope with outsiders. The solution is clearly online courses or at least blended courses with large online components. 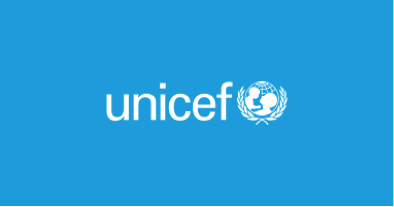 Unicef is developing a programme called the “Virtual School for Education in Crises” (or Sahabati – My Cloud – in Arabic), which will offer courses, assessments and certification in Arabic, English, Maths and science. In a study from the University of Geneva, 78% of refugees reported they would definitely do an online course – for all, this was their first experience of distance learning. The great problem many economies face is unemployed young men. The suburbs of our cities are filling up with young men who lose faith and look for a purpose in life beyond even life itself. We could go a lot further by offering cheaper, online degrees in practical, vocational, employment oriented subjects. Online degrees from the likes of IDI have multiple intakes a year and can deliver anywhere.